As HR and L&D specialists, the team at Watson Martin has built up a wealth of knowledge around Apprenticeships. Not only do we work with large levy paying organisations to deliver a complete end-to-end HR Apprenticeship package, we work in partnership with other training providers to offer the CIPD qualifications associated with their HR Apprenticeships. As experienced RoATP main providers, we believe we are in an excellent position to guide organisations through the challenges of working with Government funding and the associated regulations. 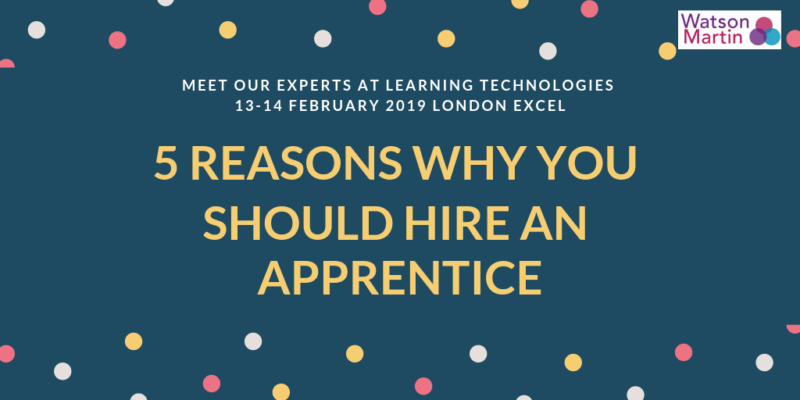 If you want to find out more about the Apprenticeship process then come and meet our experts at the Learning Technologies event at London’s ExCeL on 13 and 14 February. Our specialist team will be available on both days on stand K06. And don’t forget to come along to our seminar: How to develop HR talent through Apprenticeship Programmes taking place on Wednesday 13 February at 16.15 in the ExCeL exhibition hall. Here Sharon White and Heather Watson will give you the low down on Apprenticeships and will be able to answer your questions. We look forward to meeting you there and having a good discussion! To whet your appetite in the meantime, here are our five top reasons to hire an apprentice! Research by the Sutton Trust indicates that Apprenticeships are key to both improving UK social mobility and diversity in the workplace. If businesses are serious about tackling diversity then Apprenticeships do make it easier for employers to attract a wider range of applicants. Building an inclusive and diverse culture has been established as a crucial component to running a successful business. All the evidence suggests that Apprenticeships can help this to be achieved. Tuition fees are at an all-time high and more young people than ever before are carefully considering if university is the best route into a career. Organisations risk losing the best and the brightest if they don’t review other ways to attract young people to their companies. With apprentices come new ways of looking at things often together with well-developed digital skills which all businesses need right now! Apprenticeship funding is not only for new recruits, it can be used to upskill your existing workforce, which is good news for business. There are hundreds of Apprenticeships available to suit a range of job roles and people of all ages can apply. And don’t forget the Levy has opened up Apprenticeships at degree level which can be crucial to developing senior talent. Apprenticeships are about people having the level of investment in their skills to ensure they can perform well in their job role and are able to take the next step on the career path. Training and development is a great way to boost retention, loyalty and commitment. Evidence compiled by the CBI for its magazine Business Voice revealed that Apprenticeships encourage people to feel invested in and valued, and therefore more committed to the business. Apprentices are less likely to take sick days and stay longer than other recruits. For any size business, Apprenticeships are a great way of recruiting, training and retaining your workforce. According to the latest figures from the British Chambers of Commerce (BCC), businesses across all sectors are facing significant and increasing difficulties in recruitment which Brexit may exacerbate further. With increasing demands for new skill sets in virtually every industry and profession, companies need to adopt a more strategic approach to workforce planning. Apprenticeship programmes are an ideal way for businesses to match talent with the skills they need both now and in the future. Accessing the pot of money which has been made available for Apprenticeships will help to address talent challenges and skills gaps and build a sustainable workforce. To discuss how Watson Martin can help you implement your Apprenticeship strategy, call us on 020 7932 2760.